Warstorm is a fantasy fighting game where you pit your armies against hordes of enemies, friends, or anyone in the world. In this fantasy card game, you build an army of wizards, warriors and beasts. You then attack the armies of other players as well as go on missions. When you win battles, you earn silver and experience which you can use to get more cards and give your army new abilities. The game revolves around duels between squads composed of collectible cards. The cards come from different factions (Humans, Elves, Orcs, Undead and Demons) and types (Heroes, Units, Artifacts and Spells). Your army is made out of squads and each squad is led by a hero card. The user interface has enough slots for you to build up to 12 squads. Each squad is composed of 1 Hero, some units and zero or more artifacts and spells. Your first hero is Lord General Pozak, a Human leader. The hero chosen for the squad determines the other elements needed to form it. For Lord General Pozak, he has a ready value of 8. The ready value is found at the lower left corner of the card. It indicates how long it takes a card to enter battle after it is drawn. His unit count is 6 which is the number of combat units this heros squad must contain. His artifact count is 0 which indicates the number of artifacts this heros squad must contain and lastly his spell count which indicates the number of spells that this heros squad should contain is 0. Once you have assembled a complete squad, you can proceed to completing the missions. Missions involve an equal number of squads from your side fighting the same number of squads from the enemys side. Combat is done in a series of turns where the cards are drawn in random andstay at the bottom of the combat area for a number of turns equal to the cards ready value. When the card enters battle, it attacks the unit opposite it and does damage equal to its attack value. 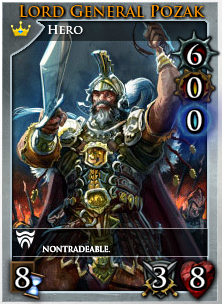 This value is subtracted from the defense value of the attacked card. If the defense value is zero, the card is destroyed and it leaves play. If there is no card in front of a combat unit when it attacks, it deals damage to the opposing armies morale. When your enemys morale reaches zero, you win the duel. When the enemy runs out of cards, you win the duel. The game has a lot of tutorial missions to help you get the hang of the different cards. Some cards are built for speed with minimal life and maximum attack while other are build to defend with minimal attack and maximum life. Other units have special abilities like archecrt, heal, zap and others. All these abilities are explained during the tutorial. In the early part, save your silver, do not buy the novice pack when instructed to do so. Just continue on to the next mission until you earn enough to buy a pre-made deck. You will need 3 squads to finish the coming missions. Once you get to 3 squads, you need to save up to get to 4 squads as the next missions requires at least 4 squads.